One of the great things about bowl season for the student athletes is that the lead up to the game is very different from any other game week. Normally, you’d have a consistent balancing act of classes, weight lifting, doing your college student thing, and then taking the field on Saturday to fling yourself into another student-athlete with reckless disregard for your body. Sprinkle in some interviews, perhaps some film work, maybe some one on one tutelage from your position coach depending on how bad or good you played last week, and that’s pretty much your game prep in a nutshell. Lather, rinse, repeat, for 15 weeks or so. Bowl week though is something completely different. And in truth, it’s really more of a few weeks. First of all, there’s the ability to focus on solely football since classes aren’t in session. Most importantly, there’s the swag bags. Instead of just getting your body beat to hell, you may get cool things like a Galaxy Tab or a PS4. For BSU, the wow factor of the gifts isn’t a knock your socks off moment, but the Cards football team will walk away with a Sol Republic deck, a Timely Watch Co. watch, a Mercury Luggage Seward Trunk luggage bag, and a Wilson football. So there’s that. For Arkansas State, there’s the opportunity to play Ball State (really quite the reward). But like many of the best moments in life, it is the unexpected things that mean the most. That’s Keith Wenning and Willie Snead. 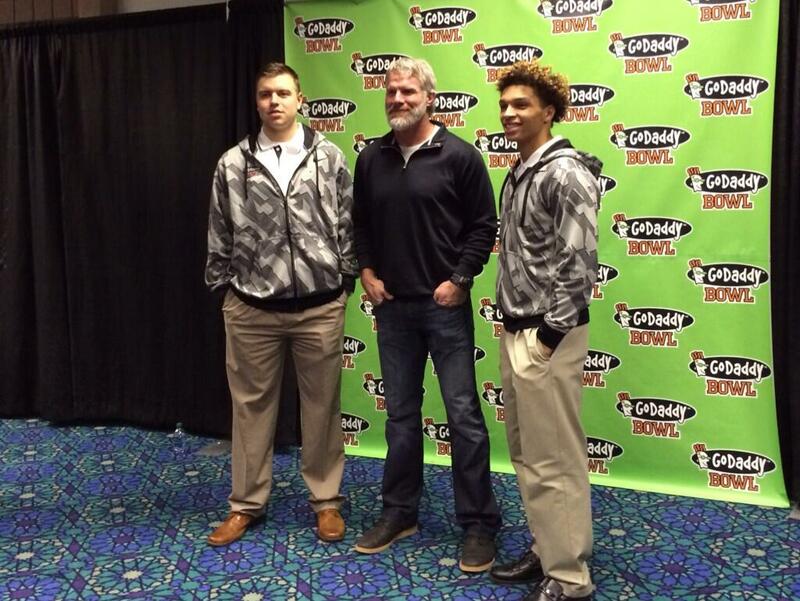 Between them is none other than Green Bay Packer/Minnesota Viking/New York Jet/prolific sexter Brett Favre. 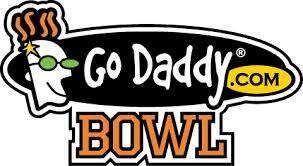 At first glance, I thought it was awesome of the GoDaddy Bowl for letting local homeless vagrants enjoy bowl festivities and a meal that at $30 a person was, I’m sure, just delightful. Glancing back at the photo a couple more times and I began to have even greater respect for the GoDaddy Bowl and their representatives for their ability to pull Kris Kristofferson to a Mobile, Alabama luncheon. But then, after further research and considerations, it was revealed to be none other than the world famous gunslinger that went by #4. I’m not sure what advice Favre would give to either team, because clearly grooming and sartorial choices are right off the table, but it is pretty awesome that the Fighting Football Cardinals were able to spend a little time with a future hall of famer, one who can give tangible concrete examples of why having a burner phone and/or not wearing crocs in compromising photos is always a good idea. So keep your watch, luggage, and football. I think the best gift of all for all us was that image above.